Urban situations will invariably include different street widths, kerbside activities, segregation requirements and junction types. Cyclists will frequently be required to make a transition to the right or left, from on-road to off-road etc. 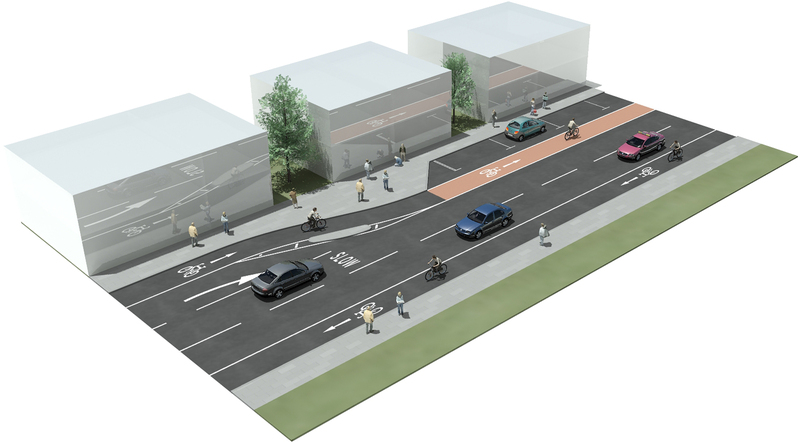 Transitions should be designed and constructed to provide continuity, comfort and safety to cyclists. The design should ensure that the bicycle does not “pop out of nowhere” into the middle of traffic, or a pedestrian environment. Rather, the change in direction of the bicycle through the transition must be designed so that it anticipated and understood by the other road users, as well as the cyclist. zone of re-establishment between the cyclist and the adjacent traffic – this is a zone for both the cyclist and the traffic to settle into their relative positions after the transition, before any weaving or turning conflict presents itself. This zone should generally be 20m long. If the transition introduces cyclists into a pedestrian situation, it is important that the transition is well-signed (i.e. no surprises for either cyclist or pedestrian), and that it is clear that the pedestrian has priority within the shared environment. 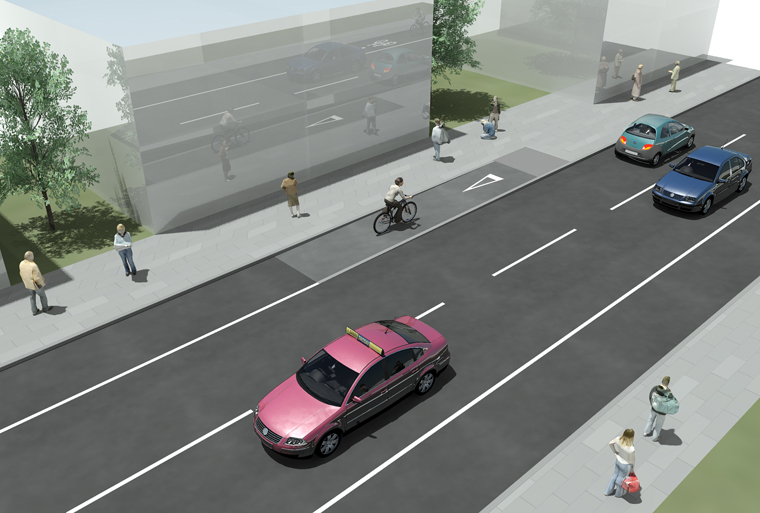 Similarly, the cycle exit from the shared space should also be obvious, especially to the cyclist. The transition should serve to ensure that the cycling arrangement (especially speed) is compatible with the receiving environment. For cycle transitions to function properly, designers must consider their curve radius, surface quality and width. The curve radius of a transition should permit cyclists to preserve momentum and maintain their balance. 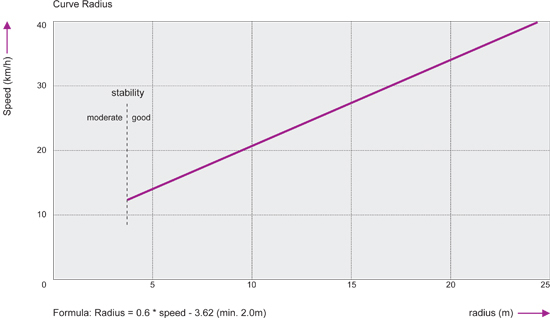 The radius increases with speed, and the graph below shows the relationship between cycle speed and the required curve radius. 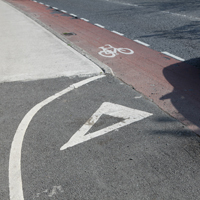 A curve radius of 16.0m along a cycle route is recommended to accommodate cyclists travelling at 30km/h. 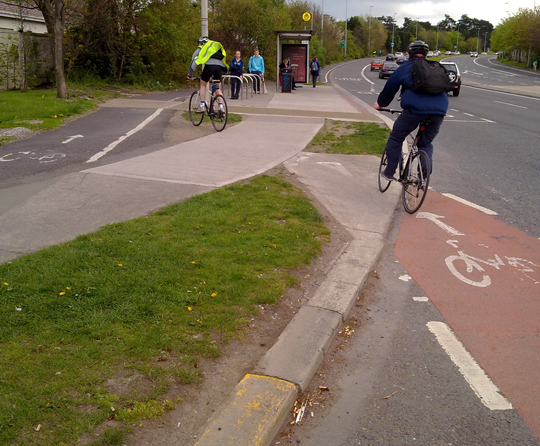 Tighter curves may be appropriate near junctions where cycling speeds are inevitably lower. Construction joints should always be at right angles to the direction of travel of the bicycle. Cyclists traversing construction joints obliquely may become “rutted” in the joints and lose balance. 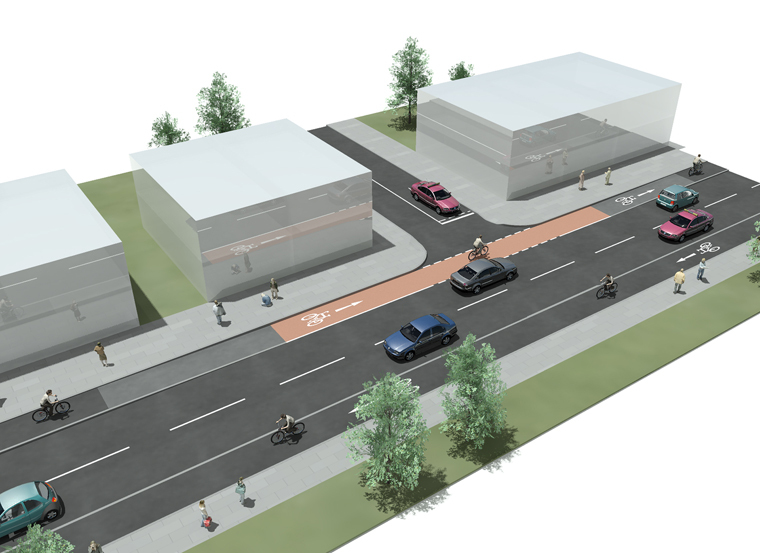 Additional width for the cycle facility will assist cyclists negotiating curves through a transition. A minimum width of 2.0m should be provided in any case. Vertical transitions involve shifting cyclists up and down from one level to another. Examples include transitions between road level and an adjoining raised track, or when bringing cyclists into or out of a shared pedestrian area. 2m long ladder tactile paving at high level to denote that transition has been reached. Give way marking on road to indicate cyclist must give way to pedestrians. Horizontal transitions are used to shift cyclists to the right or left. Examples include transitions in advance of a left-hand pocket, car parking and Island Type Bus Stops (See Section 5.1.5.2) etc. 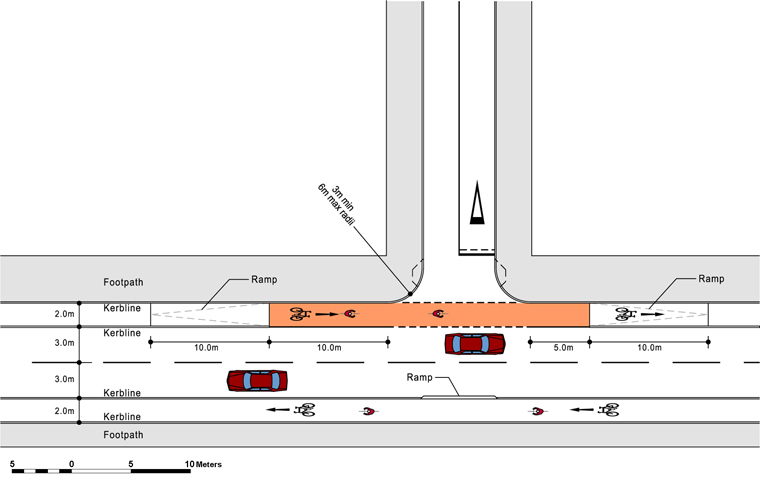 Provide a physical barrier such as a traffic island to protect cyclists from traffic behind. There are situations where cyclists will need a combination of vertical and horizontal transition. A typical example would include moving from an off-road cycle track to a cycle lane in advance of a junction, and vice versa. It has proved difficult for builders to construct combination transitions, and it has been equally difficult for cyclists to cycle on these. This manual recommends that both movements are dealt with sequentially, but not at the same time.